Dioptics Sunwear makes a line of sunglasses designed to fit over your existing prescription glasses. They have a huge variety of styles from high fashion to practical and as many sizes. I was able to find some practical looking shades that fit perfectly. For testing, I received a pair of grey-lensed Haven Everest sunglasses, and a pair of amber Night Drivers. While I have not yet worn the glasses to play a round of golf (the weather in Michigan of late has been snowy and cold), I have found them superb for driving. My first instinct was that the Dioptics Sunglasses would somehow obstruct my field of vision, but that has not been the case. The oversized lenses offer a field of vision that is at least as wide as that offered by my regular glasses. The Haven Sunglasses with grey lenses offer a remarkable degree of clarity, and at this point are my every day driving sunglasses. The grey lenses make colors look natural and sharp. In fact, everything looks sharp because I am viewing the world through my own prescription glasses. Dioptics’ sunglasses are polarized and offer 100% UVA/UVB protection. The wraparound design also blocks out stray light. Light transmission on the Haven sunglasses is 15%. Ten to thirty percent is the usual range for sunglasses. I find 15% perfectly acceptable. Dioptics’ Night Drivers are yellow tinted lenses that are designed to filter blue light. Combined with an anti-reflective coating, they are supposed to make it easier to see at night. Dioptics says that the specialized yellow tinted lenses allow you to distinguish between green, red and yellow traffic lights in a way that other yellow lenses do not. In practice, I have found the Night Drivers to be useful in some situations — particularly in hazy twilight conditions. We’ve had a lot of those lately here in Michigan, where there has been a lot of wet weather that isn’t quite freezing. They also seem to be useful in city driving conditions, with all of the reflections from headlights, streetlights, signs and the like. I am less certain of their utility in darker conditions, such as on major highways. Night Drivers by Solar Shield with yellow tinted lenses filter out a great deal of the blue light in HIDs, virtually eliminating their blinding light. Both of the pair of Fit-Over glasses are so lightweight I barely notice when they’re on. I have on several occasions walked into several stores wearing the shades and not realized they were on until I noticed that the entire store was unnaturally dark. The frames of the Dioptics glasses are made of Nylon 66, while the temple pieces are rubber. They’re very lightweight and quite thin. The Dioptics frames also seem as though they are less brittle, and thus more durable than the plastic frames of many other products. There is also a nice finish on the Haven sunglasses. 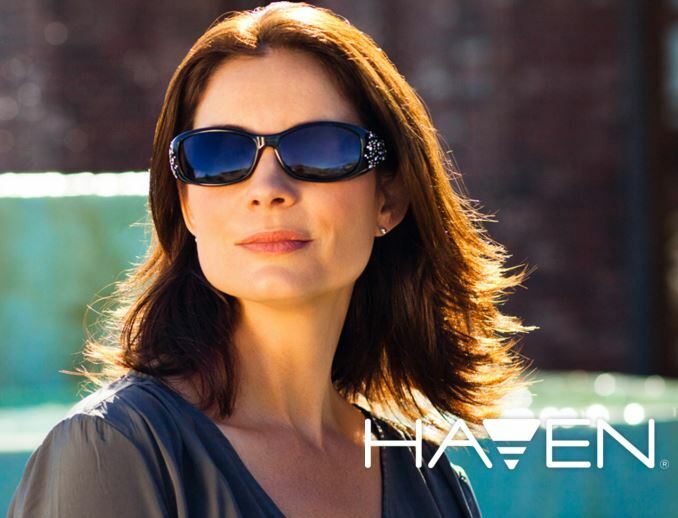 Both the Haven sunglasses and the Night Driving glasses are treated with a coating to protect from scratches, and an oil- and water-resistant layer. If there’s a downside to the glasses, it may be that they can make you look like you have gigantic bug eyes. Picky fashionistas may object to the look, but I don’t think it is as bad as all that. I’ve seen plenty of really big sunglasses on Hollywood stars and starlets. As you can see from the photo at left, the Dioptics glasses look quite fashionable. I like the Dioptics glasses — and the sunglasses in particular.